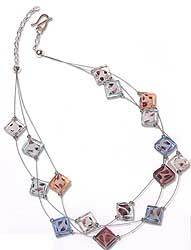 Apart from using french crimps to add fasteners to wire jewellery, you can also incorporate them in your design itself. They can create 'floating-beads' designs (also sometimes known as 'illusion jewllery' ... because the beads are made to appear like they are floating along the necklace or jewelry piece. 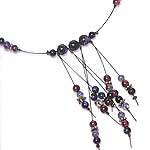 You can create the 'floating beads' designs with single or multistrands. 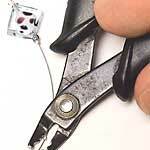 1) Use the crimp beads on either side of where you want you beads to be. Crush the crimps on either side to position your bead(s). You may need to position a small bead (e.g. a small spacer or seed bead) on either side of your featured bead to stop the crimp bead going into the hole of the main beads. 2) Position your floating beads using a ruler or do it by eye.